Can you believe it’s already time for back-to-school preparations? 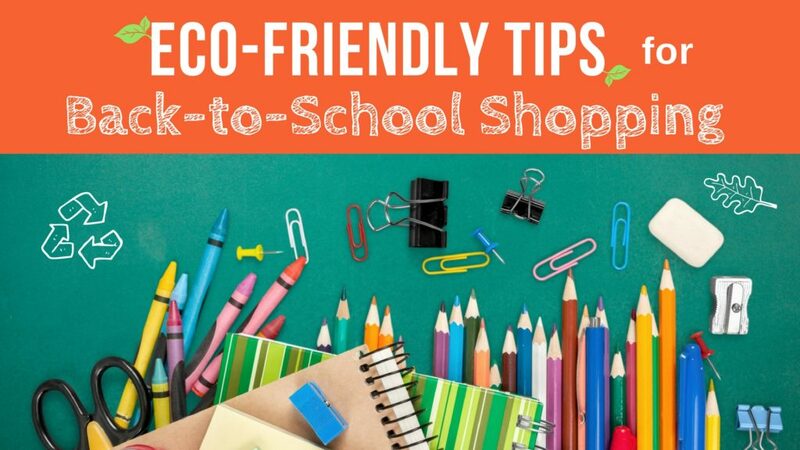 Before you hit the stores to stock up for the school year, check out these tips to reduce your impact on the environment. Education leads to bright futures for kids – let’s make sure it supports a bright future for the planet as well! Did you know that Bic has sold over 100 billion disposable pens since 1950? That’s enough to circle the earth 350 times. 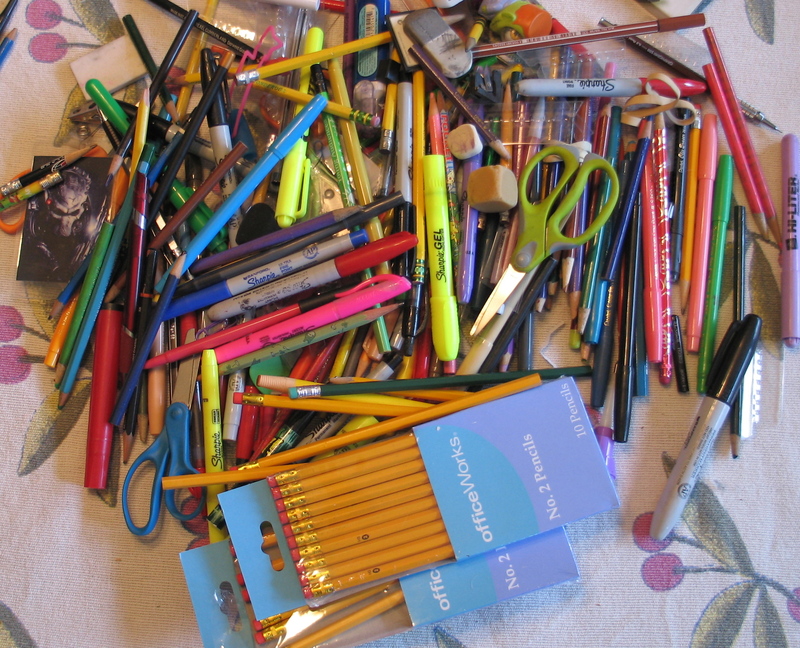 Reuse supplies you already have – easiest and eco-friendliest back to school prep ever. Just because it’s a new school year, it doesn’t mean you have to go out and replace all of last year’s supplies. Before you shop, evaluate what you do and don’t need. Are there any supplies from last year that can be reused this year? Pens, pencils, crayons, scissors, pencil cases, binders, folders and even notebooks may still have plenty of use left in them. The biggest way to reduce your impact is to use what you already have. Quick Tip: You can remove marker from binders and glossy folders with a swipe of alcohol. Good as new! When reusing isn’t an option then look for the most eco-friendly product. Perhaps that will include an upgrade to an item for reuse next school year. Buy Non-Toxic. You’d be surprised by what can be lurking in school supplies! Many supplies contain PVC or BPA – both toxics used in plastics. Check out this guide to avoid PVC in school supplies. When purchasing markers or kleenex, be sure to get non-toxic and unscented varieties. Avoid disinfectant wipes and anti-bacterials in items such as soap or hand sanitizers. Disinfectant wipe labels warn users to keep out of reach of children and wash hands after use. Children should never be directed to use disinfecting wipes – try educating your school to avoid their use with this fact sheet. Buy Pre-Used or Host a Swap. Resale shops such as Goodwill now have office and school supply sections. Try organizing a school supply swap with local families. It could be the start of a fun annual tradition. Buy Items that Last and can be reused next year. For example, a wooden or metal ruler will outlast a thin plastic one, highlighter pencils will never dry out, and some folders are much sturdier than others. Buy Reusable. Do you remember when people used to buy nice quality pens as gifts and refill them? They still exist! Inexpensive options are available too. Buy Recycled (and recyclable!). Look for recycled content paper products – the difference in appearance is virtually unnoticeable. 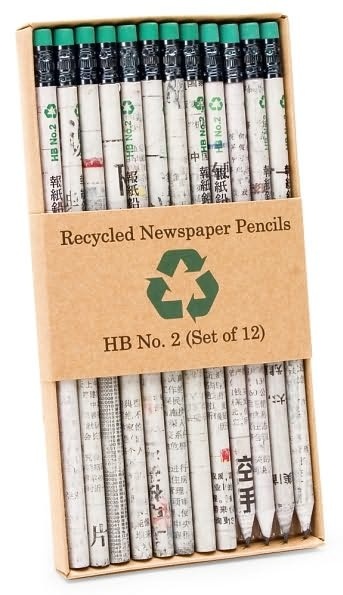 You can also buy pens and mechanical pencils made from recycled plastic and pencils made from newspaper. 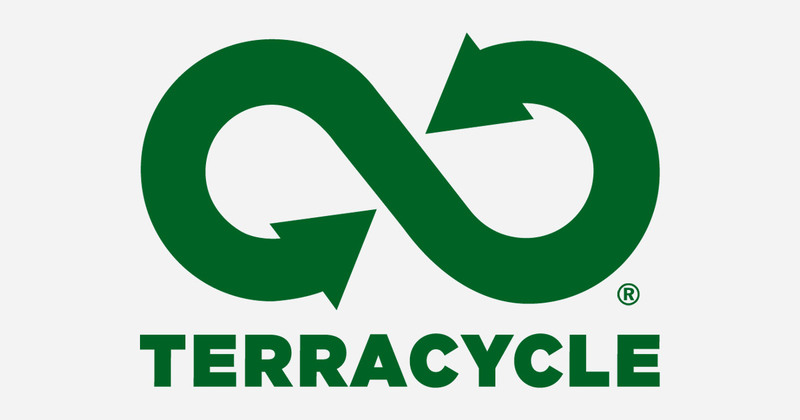 Terracycle offers plastic-free recycled binders. Here are some more great tips with links to products from Environmental Working Group. This one is fairly straight -forward. You can rent textbooks or buy used novels and texts from a local used bookstore or on Amazon. Talk with friends or neighbors with older kids to borrow books for the year. Not only will you save paper but you’ll also save money. 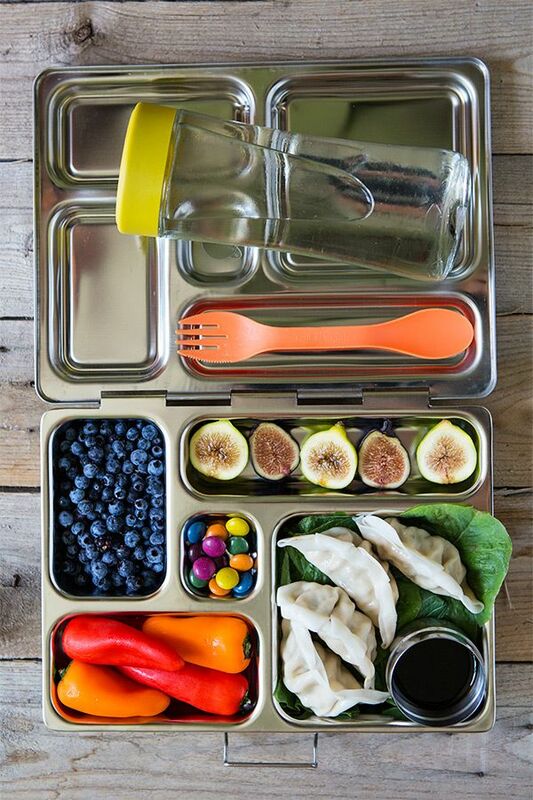 Upgrade from disposables to healthy, zero-waste lunch options this year. Opt for a reusable bag or lunchbox, reusable water/juice bottle, a cloth napkin, silverware and glass or metal food containers – even little baggies to replace those ziplocs. Check out Mighty Nest or pinterest for some inspiration. Browse with your child and they can choose something they’d look forward to using. If you are trying to avoid plastic altogether, check out these suggestions from My Plastic Free Life. If your kids buy lunch, they can still bring their own napkin and silverware to cut down on waste. The average school-age child generates 67 lbs of waste from lunch each school year. That’s over 20,000lbs annually for a school of just 300 kids. It may seem like a lot of money to invest in some reusable gear but in the long run you’ll save over single-use and single-serving-size items. You can find some of these items at a resale shop (cutlery for sure!) or reuse containers from the grocery store (jars, plastic yogurt tubs, lunch meat containers, etc). New-to-You: Shop resale or organize a clothing swap among friends – you can try advertising in a Facebook group for local parents. There are also online apps for buying and selling gently used clothing such as ThredUp or Poshmark. Buy Quality: Buy the best you can afford. Sometimes price does reflect quality. Cheapest isn’t always the best in the long run if items have to be replaced more frequently. 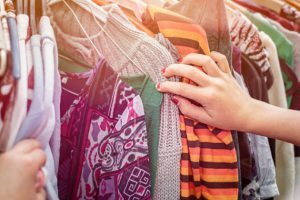 Clothing made to last can be passed on to siblings or donated. Investing in repairs for better quality clothing is more feasible as well. Some quality goods have better environmental practices such as Levi’s Water<Less jeans initiative. Rent: For special occasions where an outfit may only be worn once such as homecoming or prom, renting may be a better option. Check out Charlotte’s Closet for girls looks. Recycle: Donate or sell wearable clothing. Non-wearable items can be recycled through textile recycling programs. Goodwill, H&M, and Levi’s offer recycling for all kinds and brands of textiles at their stores. Levi’s provides a 20% discount on a purchase as an incentive. Madewell stores accept denim for recycling and provide a discount for a purchase. First, host a swap! Any leftover books and gently used supplies can be donated to us, Goodwill or a local after-program. Check out a full list of what we collect at SCARCE. Binders in poor condition (with writing, torn, or breaking apart) can be taken to Office Depot/Office Max for recycling through Terracycle. Find a location near you here. Bonus: You get $2 off the purchase of a new binder for bringing yours in. Crayola offers a recycling program for markers, any kind and any brand. Currently, schools are the only allowed collection points for the Colorcycle program – get yours involved!